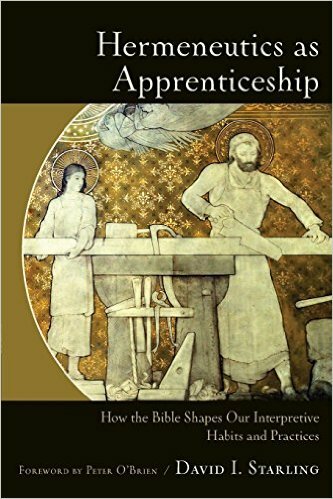 In the introduction to Hermeneutics as Apprenticeship, David Starling suggests that scriptural interpretation should be thought of as “requiring not just sweat but skill, and not just skill but character” (p.17). Throughout the book’s pages he emphasizes that readers should consider biblical hermeneutics to be, not merely an austere set of rules for interpreting the Bible, but also a craft that one participates and grows in. Part of what Starling seeks to address in Hermeneutics as Apprenticeship is the problem of “pervasive interpretive pluralism” present in Protestant and evangelical hermeneutics (pp.7-8). One way of defining the issue can be found in Christian Smith’s The Bible Made Impossible. In this book, Smith essentially asks how it can be that, given the claims made by many evangelicals about the clarity and accessibility of Scripture, there are still significant disagreements amongst sincere, devoted, and intelligent evangelical readers about how to best understand and interpret it (The Bible Made Impossible, p.17). Starling notes that this is not exactly a new problem. In some ways, it’s an issue that goes back to the dawn of the Reformation itself. The maxim, “Scripture is its own interpreter,” does likely have some pre-Reformation era precedents, but Starling mainly focuses on Luther’s use of the proverb in response to those who criticized his insistence on the clarity of Scripture and the right of all to read and interpret it (p.10). In Hermeneutics as Apprenticeship, Starling unpacks this maxim into three distinct senses. It is this third, reflexive dimension that Starling finds to be especially fertile ground for exploring the idea of hermeneutics as a journey of apprenticeship to the canonical authors. In relation to them, he writes, “we are their apprentices in the art of reading Scripture, learning from them how to understand Christ (and all things) in the light of Scripture and Scripture (and all things) in the light of Christ” (p.19). While Starling finds the imagery of apprenticeship helpful for thinking about the process of forming healthy habits and dispositions of theological interpretation, he also wants to acknowledge that this isn’t meant to “reduce the role of the contemporary interpreter to an unthinking, unimaginative mimicry” (p.18). The majority of the book is made up of essays—Starling calls them “case studies in inner-biblical hermeneutics”—looking at topics like the hermeneutics of delight in the Psalter, the hermeneutics of obedience in Matthew, and the hermeneutics of exhortation in Hebrews, among others (pp.vii-viii). In each chapter, he spends most of his time dwelling on an interpretive issue dealt with by a biblical writer, attempting to think through how the “habits of mind and heart” displayed by the biblical authors can help readers better learn “what it means to receive the biblical writings as Holy Scripture and… appropriate their words in our own situation” (pp.20-21). Some of the essays seemed a bit fuzzy, making it difficult to discern how exactly they were supposed to shed light on the interpretive habits Christians should cultivate. However, there were also some very interesting essays, especially his chapters on the interpretive riches in the Psalms, Luke, and Hebrews. Starling’s book enters into ongoing discussions regarding the nature and ongoing validity of Apostolic hermeneutics carried on by people like Richard Longenecker (Biblical Exegesis in the Apostolic Period), Richard Hays (Echoes of Scripture in the Letters of Paul and Echoes of Scripture in the Gospels), and Peter Enns (Inspiration and Incarnation). While he does spend a little time dealing with these discussions, he unfortunately moves past them rather quickly. Given that this is a book about learning to more wisely interpret Scripture by studying the work of the biblical writers, this seems like a relevant subject that I wish he had wrestled with more deeply. On a more positive note, I was fascinated by Starling’s exploration of the different dimensions of the maxim “Scripture is its own interpreter.” His discussion of the passive, active, and reflexive dimensions of the phrase was for me one of the most intriguing parts of the book as a whole. Hermeneutics as Apprenticeship might not solve the problem of pervasive interpretive pluralism in the Protestant world, but it does point people towards the value of being more attentive readers of Scripture, and it underscores the fact that interpretation is both unavoidable and (in some ways) more of an art than a science. Starling’s proposal for thinking of hermeneutics as a process of apprenticeship was also quite helpful. It strikes the imagination and lends deeper meaning to the years of bible reading and discussion that go into the long-term rhythms of most local Christian communities. I think many readers will benefit from Starling’s work. *Disclosure: I received this book free from Baker Academic for review purposes. The opinions I have expressed are my own, and I was not required to write a positive review. This entry was posted in Book Reviews and tagged Apprenticeship, Biblical Hermeneutics, Book Reviews, David Starling, Hermeneutics, Intertextuality, textual interpretation, theology by joecrow91. Bookmark the permalink.